The lovely Wivenhoe Hens are back at their usual coop site - in the car park of The Station pub. It feels great to have improved the coop this way, and the hens certainly seem to be enjoying it. We welcome visitors, enquirers, people who are thinking of keeping their own hens (happy to share the best and worst of our own experiences!) so please drop by or email us. The hens love to eat your spare vegetable peelings too - they get vitamins from the high quality food we feed them - but they love the taste of real greens! The only rules are NO potatoes, rhubarb, avocado or cooked food. Richard Heinberg (who he?) describes Transition Towns as a replicable strategy for harnessing local talents, vision and goodwill. Which sounds about right to me. So what happens if you harness local talent, vision and goodwill and point them in the general direction of the local economy? More social enterprises? Credit Unions? Skill sharing? Harnessing community buying power? A local currency? Co-ops? More fairness? A Wivenhoe Businesses' loyalty card scheme? Only one way to find out. 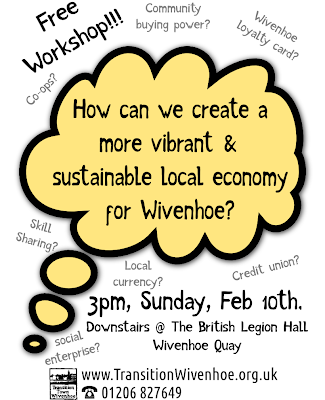 We're hosting a free public workshop entitled 'How can we create a more vibrant and sustainable economy for Wivenhoe?' on Sunday, Feb 10th at the British Legion Hall (downstairs), starts 3pm. All are welcome. "An opportunity to become involved in a food cooperative"
If you didn't know already, a food cooperative is where a group of people come together to purchase food in bulk quantities reducing cost and ensuring good quality locally sourced produce for members. 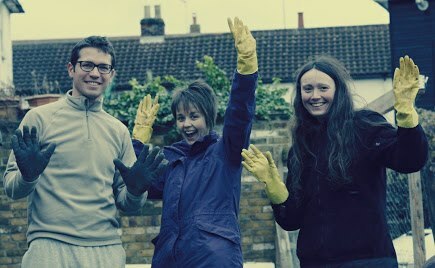 Students from the Essex University are setting up a food cooperative on the campus. It will primarily serve the students & campus. But the group will be open to all. A workshop is being held to help start up the cooperative. The workshop will be a chance to learn about the structure of a cooperative and how you can become involved. The session will be ran by Nick Weir from the Stroudco Food Cooperative. If you are interested in getting involved with the food coop please come along to the workshop. We will need plenty of volunteers as well as members to run the cooperative. Can you help??? Visitor Parking is available on Campus. But we would encourage you to use alternatives if possible. There are cycle parking places throughout the campus. As well a regular bus service to the campus. Hooray! We've done our very first Bike Kitchen - a community workshop where you can bring your own bike, borrow the proper tools, and learn how it ticks under the watchful eye of an experienced bike mechanic. There was also cake. We looked at the 4 simple tweaks that will turn almost any bike from an uphill battle into a purring, whirring and graceful carriage of effortless mechanical perfection. Actually, we only looked at 3.5 of them and then ran out of time. But we're doing it again next Saturday, and will book the venue for an additional half hour to make sure we can cover absolutely everything. The next bike kitchen is Saturday , January 12th at 2pm in the Scout Hut and lasts for 2 (and a half) hours and it's free (any donations will help pay for the hall).